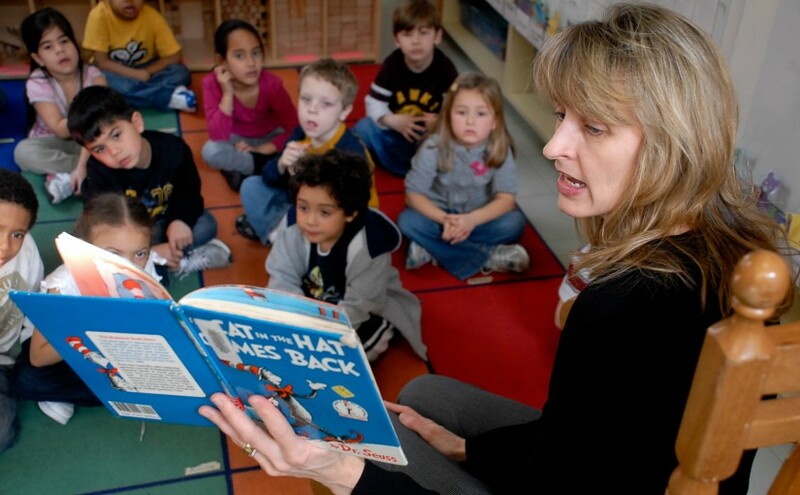 Libraries can play an important role in children’s lives. They are a safe place to spend time and discover the joy of reading. Libraries are also spaces for community—places to play and discover, imagine and inspire, learn and study, and even take some much-needed quiet time. But children won’t flock to the library just because it’s good for them—like any space for children, a library needs to be inviting, engaging and fun. Libraries are pretty big spaces, especially from a child’s perspective. To make them more inviting, break it into smaller “zones” of space focused around different functions and activities. 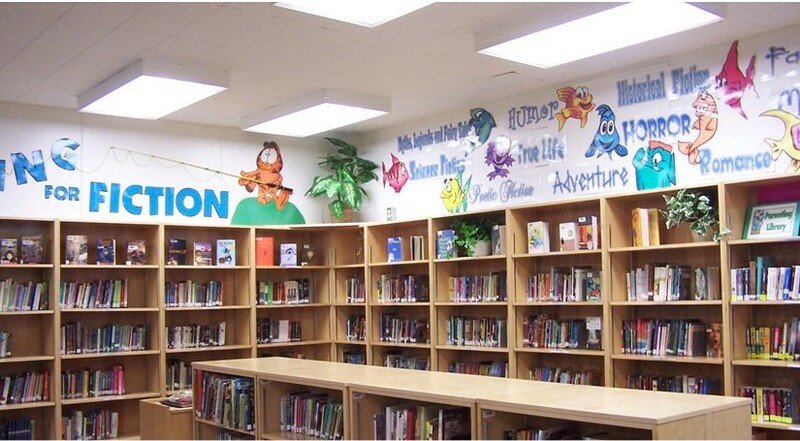 This can create the illusion of smaller spaces while introducing more variety, which will engage children better. Remember, cultivating the right environment within a library can be just as important as cultivating its collection—so be sure to give it the consideration and forethought to make the space useful and inviting. For children, play time is a highly engaged learning opportunity. The more stimulating the activity is, the more their minds develop. Help kids get the most out of their play by creating engaging, multi-sensory experiences for them. Look for ways to enhance play experiences within the library with ways to stimulate kids’ sense of sight, smell, touch and sound. In addition to having several zoned spaces available with multi-sensory experiences, it’s also important for those spaces to meet a variety of needs. Children need spaces where it’s safe to be highly active as much as they need spaces for quiet time. They need spaces for interaction as much as they need spaces to be alone in. Create a variety of spaces that meet these varied needs for different age groups. Consider making spaces flexible with furniture that is easy to move around, so kids can create their own spaces, too. This tip applies both literally and figuratively. 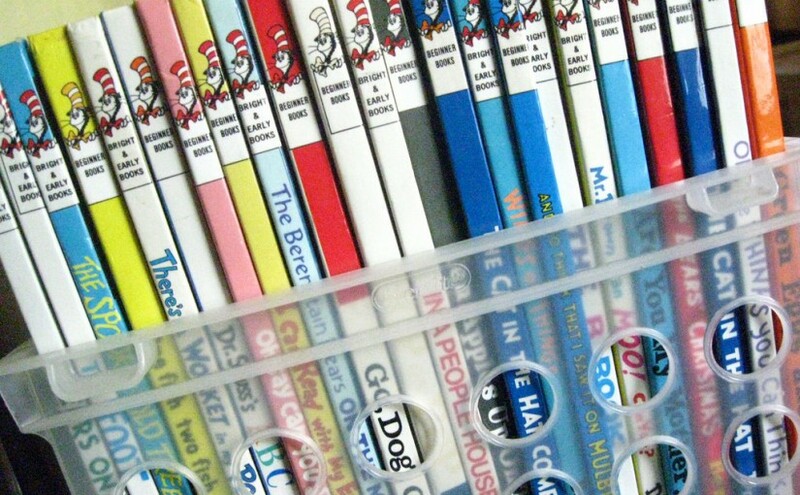 On a practical level, a children’s section of the library should be accessible to children—that means keeping shelves lower so that kids can find and look at books on their own. 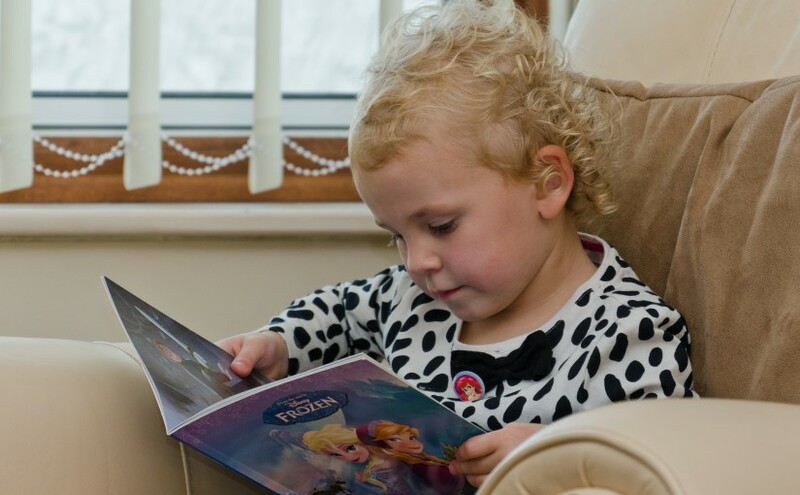 It also means providing furniture and spaces that are made specifically for children of various age groups, so they are comfortable as they enjoy the library. But it also means thinking creatively to find fresh ways to engage young imaginations. Be playful and whimsical with how you decorate the walls, arrange the shelves and set up displays! For libraries just starting to modify its space to better engage children, don’t worry about trying to do everything at once. Start small, and focus on the quality of experiences rather than how extensive they are. As a starting place, consider identifying a need that could be addressed with the creation of a space zone, or an bring in a local expert for an activity. When things get busy during the year, it can be easy to overlook what a fantastic job your child’s teacher is doing. 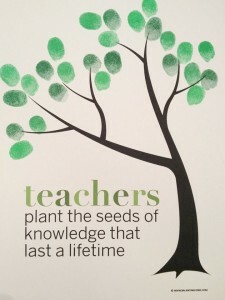 Teachers put in much more time and effort than we might realize, often going above and beyond in order to give our kids a great education, so the end of the school year is a fantastic time to recognise this. 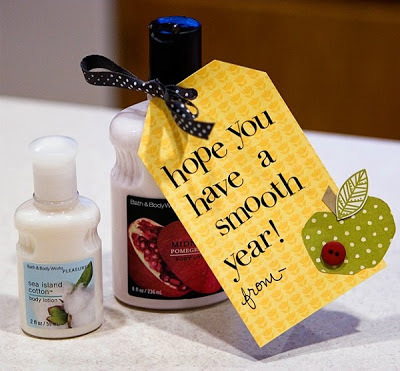 Help your child to honor their teacher with this fantastic list of simple, inexpensive gifts which are suitable for both male and female teachers. Some of these gifts can be made with a few simple materials which you may even find around the house, some require a small purchase and others simply require your time. Easy and inexpensive, this sharpie gift is both practical and fun! Teachers love when they are given gifts of stationary supplies that they would otherwise have to purchase so this small but cute gift will go down a treat. Have you child grab a pack of sharpies and a piece of paper and let them tell their teacher how much ‘color they bring’ to the world, or how ‘sharp’ they are! 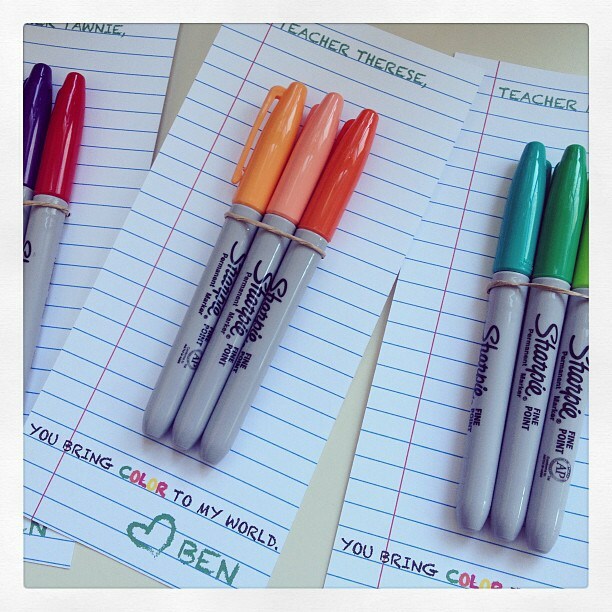 If your child has more than one teacher that they want to give an appreciation gift to, you can buy a larger pack of sharpies and divide it up – it couldn’t be simpler! This collage is super fun to make and will bring a smile to any teacher’s face! Grab a range of candy bars which have words that you can incorporate into a story or a series of messages and glue them onto a large piece of paper. After the teacher has enjoyed it on the wall, he or she can raid it for snacks! This collage is also fantastic for encouraging your children to put words into context and be creative! 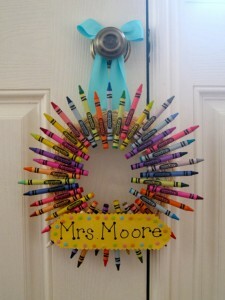 Beautiful as a classroom decoration, this crayon wreath is the perfect gift for a teacher of any age classroom. 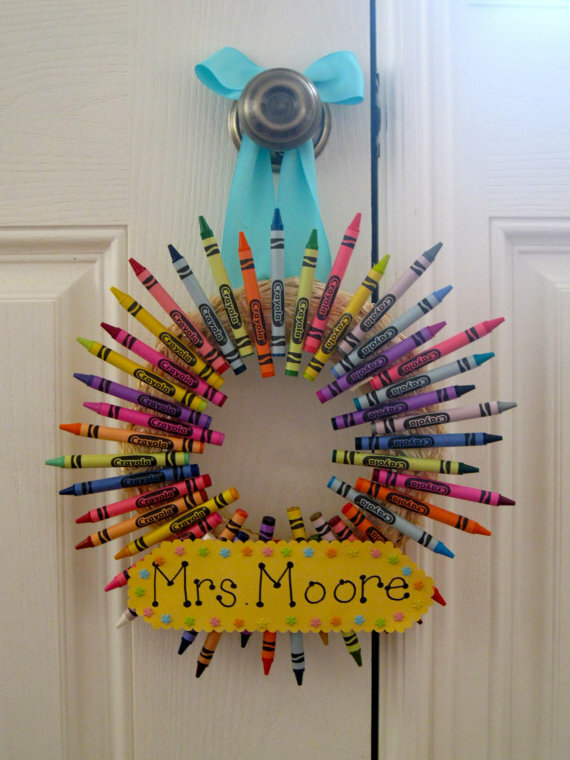 Simply purchase a packet of dollar store crayons and a basic wreath (or you can fashion one yourself out of paper mache or a pool noodle) and stick the crayons on the wreath at even intervals. 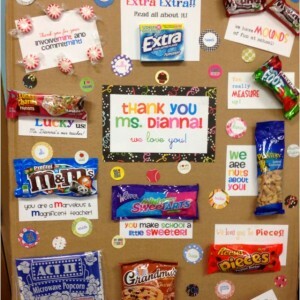 To add an extra touch be sure to add a nice sign with your teacher’s name on it. This one is super simple and can be picked up while you shop for your usual groceries. Simply have your kids draw or print a super cute sign about how ‘nuts’ they are about their teacher and attach it to a snack size bag of peanuts or other nut. 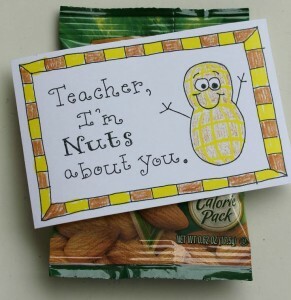 These nuts will make the perfect morning tea for the teacher! With colds and flu’s rife in schools, teachers sure need their vitamin C! 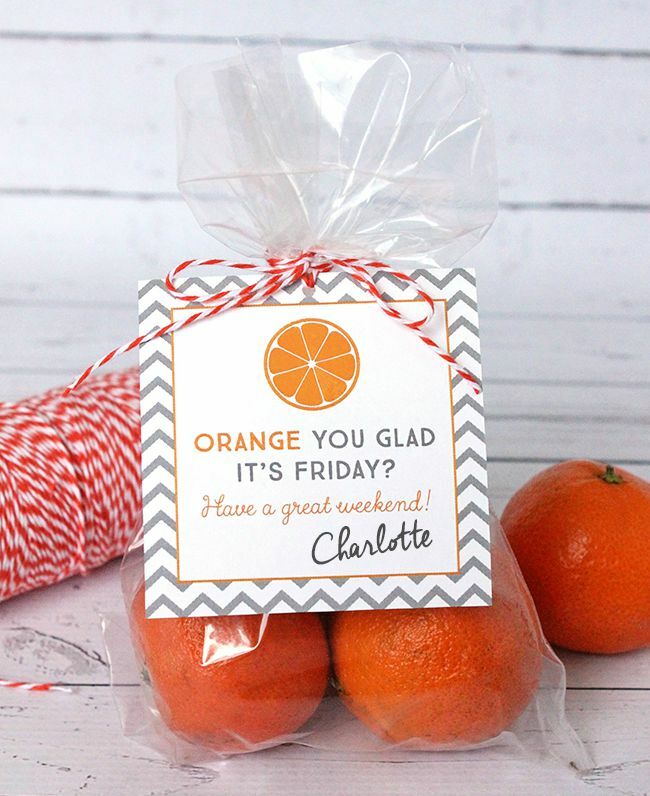 Make sure they get it with this fun and healthy gift that will brighten up their day! 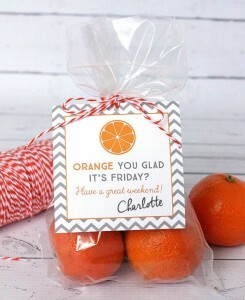 Simply bag up some oranges with a bright colored ribbon and print or draw a sign that reads “Orange you glad” it’s the holidays, the weekend (or whatever message you choose). Kids will love putting it together and teachers will love receiving it. Adorable and tasty, you can’t lose with this super cute and easy gift. 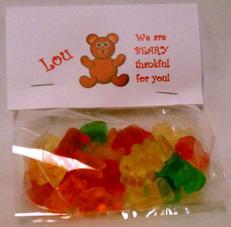 Simply package up some gummy bears and attach a card telling the teacher how ‘bear-y thankful’ your child is to have them as a teacher. Just make sure all the gummy bears end up in the bag bound for the teacher! 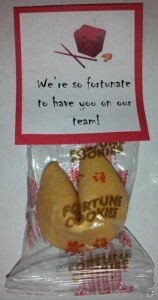 No matter how old you are, cracking open a fortune cookie never stops being fun. Fortune cookies are super easy to find in stores so grab a box and attach a tag telling your child’s teacher how fortunate your child is to have them. This is one of the cheapest gift ideas and is a great idea if you need to give a gift to multiple teachers. If you want your teacher appreciation gift to be super personal and almost free, then get this great printable and have your child or children place their fingerprints on it for the tree leaves. Your teacher will treasure the time and effort your children put into creating this beautiful piece of artwork, just for them. Yes, you read that one correctly! This pencil holder is quite literally…made from pencils! 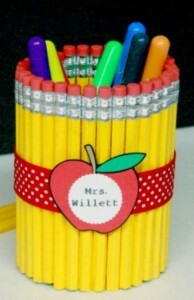 Cute and easy to make, your teacher will love how themed this pencil holder is and will give it pride of place on his or her desk. Simply hot glue plain HB pencils around a clean, old aluminium food can and secure with a ribbon. If you want to go the extra mile, you can even fill the pencil tin with pens and pencils for your teacher to use, or fill with confectionery for those must-have-sugar moments! Learning vocabulary an important part of education and life at any age. In fact, several markers of success in life have been correlated to having a larger vocabulary. In addition to this, keeping your students at grade level standards for vocabulary comprehension is critical for passing standardized assessment like Common Core’s PARCC tests. But it takes more than copying down a new word’s definition for students to gain a true command over new vocabulary words. To help students grow a deep understanding of words, use interactive methods that make your students interact with the words in many different ways. Seeing new vocabulary words in context helps students learn new words. Encourage this by maintaining a large library of books students can borrow that are appropriate but challenging for the students’ level. Have students skim each chapter before reading it and write out any words they don’t know and use their lists as a guide to create a vocabulary list for the class. Before reading the chapter in full, review the list and their definitions. This can be as simple as having students pair up with whoever sits next to them to discuss, or write it on paper. What’s important is that each student takes ownership of each word by explaining it themselves. As a class activity, have students create their own pictures (or other symbolic representations) of the words on the vocabulary list. This helps students think about a word’s meaning and gain a deeper understanding. This exercise is another way to tap into students’ creativity and get them to think more critically about the meanings of words on their vocabulary list. By creating their own analogies, students must determine their own understanding of a word’s given definition. Much like creating analogies for vocabulary words, this exercise makes students use other words in their vocabulary to develop a stronger contextual sense of the word’s definition. Have students create their own jingles for the words and definitions. The repetition of these creative exercises will help students engage with the vocabulary words with many different parts of their mind. Even better, a jingle can double as a mnemonic device that students can use as a reminder for words later on. Keep reviewing old vocabulary words with games. Don’t let old vocabulary words disappear after the test. To make sure those words become a long-term part of students’ vocabulary (and that they’re fresh for the end-of-year assessment), create games to play as a class that will reinforce them all year. Need ideas? Here’s a good place to start. When these many different interactive learning techniques are used together, students develop a strong command over new vocabulary words. Better yet, an ability to use and understand these words stretches far beyond the next test and throughout students’ lives. When you think of children in the classroom, it is likely that your mind turns to studious heads bent low over notebooks, textbooks and worksheet handouts. It is likely you think of children turning in handwritten assignments, and if they are very young, learning to read and write like you did as a child. 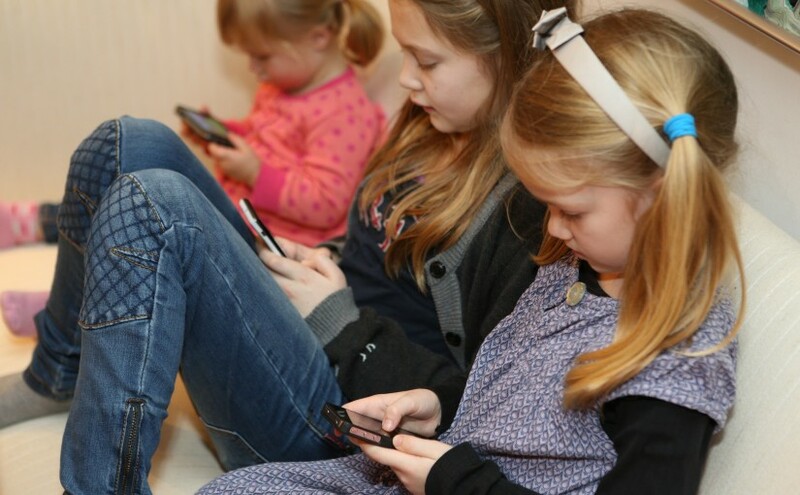 It is unlikely, however, that you think of those same children leaning over tablets and computers, playing educational games and sending in assignments that are typed, but this very picture is becoming a reality in a lot of classrooms around the country. Tablets and computers in the classroom offer some very distinct advantages to the elementary school student beyond just the novelty of using a computer in class. Electronic devices such as computers and tablets really are the way forward. Keep reading to learn why this is. Web 2.0 technologies in the classroom are quite interactive. 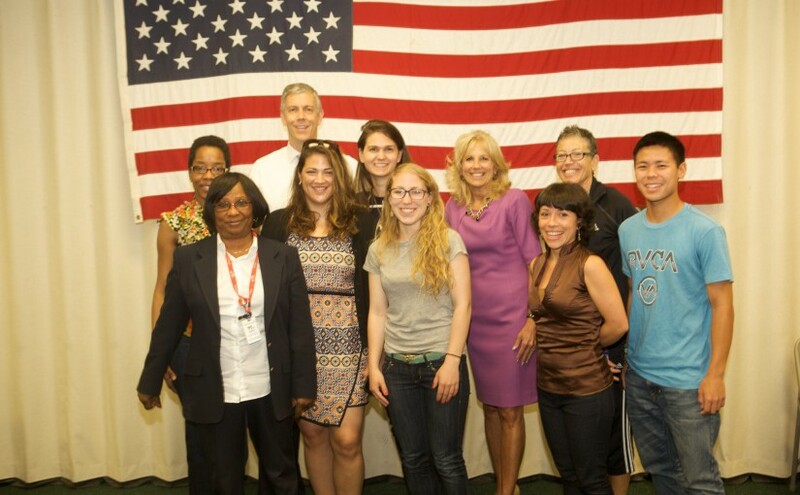 They allow students to write, publish and edit which are important workforce skills. Students are also encouraged to collaborate with other learners who may have different learning styles. This builds teamwork skills, as well as helping students become effective communicators with a wide variety of other students in classrooms across the country. This exercise also encourages problem-solving as students may have to work around such issues as language barriers and accessibility needs of others they come into contact with. Furthermore, this increased interactivity allows students to have an authentic learning experience in a way that is difficult to reproduce in physical space. Not all students learn in the same manner. Computers and tablets in the classroom can help every student, based on learning style. Education no longer has to be simply a matter of writing and memorizing facts. Students can be shown how things happen, and in some cases they can actually have a chance to do things hands-on, even virtually. 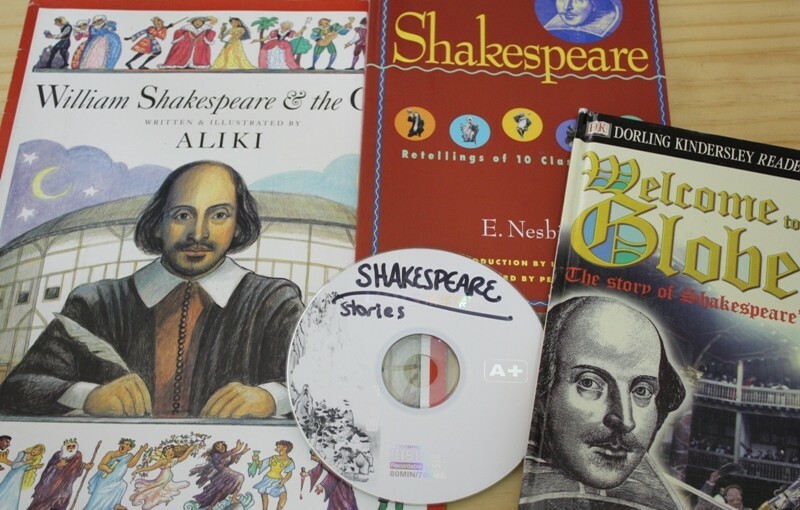 Also, for those students who have English as a second language, or those with learning disabilities there are podcasts and vodcasts, which allow students to have the content read aloud to them, and also to go back and study content which they have previously had difficulty with at any time. STEM is an acronym that stands for Science, Technology, Engineering and Math. These skills are all very important if a student plans on entering the job market later in life. It is important to start teaching children these necessary tasks even in the early elementary years. 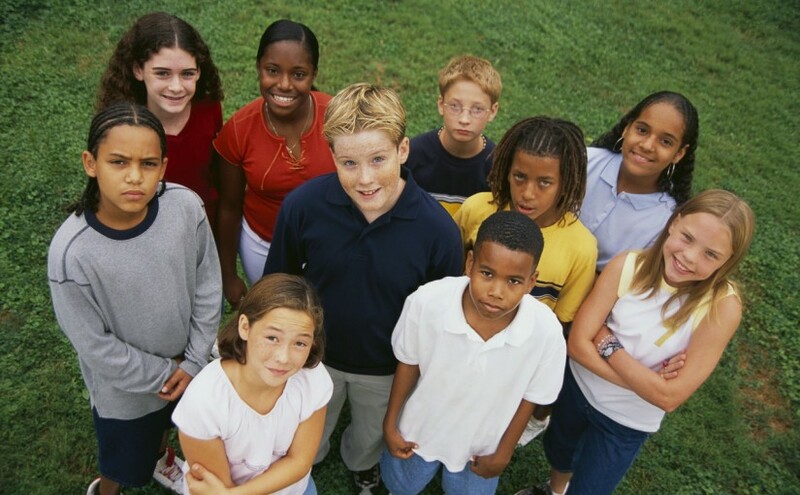 Furthermore, an increase in digital literacy early on means that children, by the time they are ready to find a job, will already be familiar with computers and tablets, and will not have to take classes on basic computer use before seeking that first job or college education, as many college classes also have a computer component. Learning early use of computers is overall an important skillset for students, and what better place to learn than in the classroom? Computer-aided curricula allow students to become better problem solvers. They also learn to more effectively manage as team players, to anticipate and work with the needs of others, and to positively collaborate with children who may be quite different than themselves. Further, technology in the classroom allows for the lesson materials to be tailored to a child’s individual learning style. Computer-aided lessons also allow for a hands-on experience and incorporation of the STEM subjects into the curriculum. Therefore, having computers in the classroom really is the way to proceed.